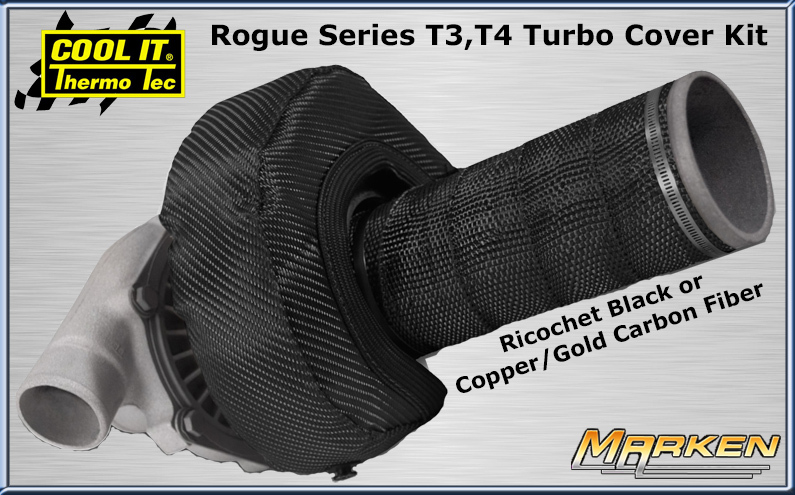 The Thermo-Tec Rogue Series T4 Ricochet Turbo Kit # 15072 includes a Turbo Cover, a 2" x 25' Roll of Rogue Series Exhaust Wrap, 2 - 18" snap straps and 10' of wire for easy installation. The new, easy fit design of the Rogue Series Turbo Cover keeps the turbine spooled up, reducing turbo lag. The dual layer construction increases performance and durability, reduces under hood temperatures, improves horsepower and performance by maintaining temperatures inside the turbo. Also available for T3 Turbos and available in Copper/Gold Carbon Fiber color. You can just get the Turbo housing cover as well.